John of Salisbury (c.1115-1180) was an exceptionally well-educated and well-connected historian and philosopher, who knew King Henry II, Thomas Becket, and Pope Adrian IV intimately. He dedicated his most important writings to Becket, and witnessed his martyrdom in 1170. The present manuscript of his collected works was written at the abbey of St. Albans. The start of Book V of the 'Polycratus' is marked with an extremely elegant foliate arabesque initial in standard colours, red, blue, and green, while the use of purple for the rubrics is unusual. In the left margin the vertical annotations are monograms made up of the letters 'N o t a' (Take note! 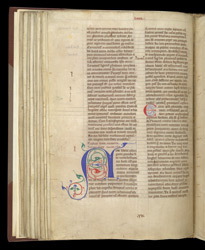 ), while in the lower margin the quire number 'VII' is prominent.